This walnut and maple humidor featured on CustomMade.com features a false bottom with a secret drawer below. The front panel pulls out from its false dovetail joints to reveal the hidden compartment drawer. 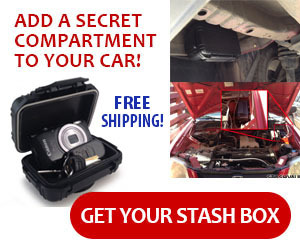 This useful piece of furniture is available from Secret Compartment Furniture. The top lifts up and the bottom molding pulls out to reveal secret compartments. The side panels open up to reveal large compartments large enough for long firearms.